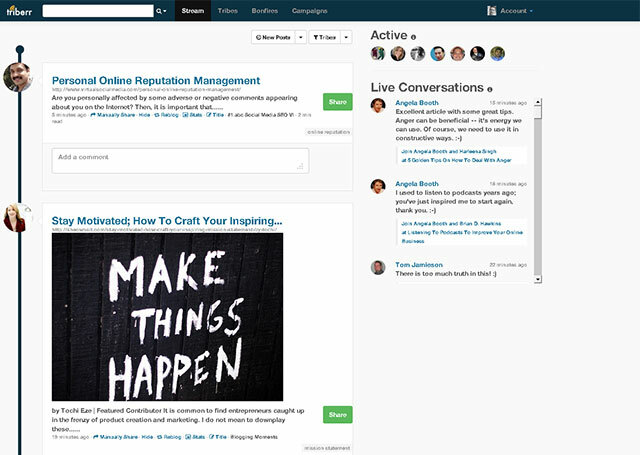 Triberr is a very powerful traffic and engagement tool. It is still not so famous like other traffic generation devices but you can see this as an opportunity to grow your business in an environment that is still not so crowded and not so competitive. How to take advantage of this new platform? What Triberr strategies can you use to increase exposure and get more visitors to your site or blog using this online community? This is what I want to share with you in this post. Now, let’s see some strategies and tactics you can use to increase exposure and drive more traffic. This is the simplest strategy. Join other people’s tribes as a follower. This will provide you with a lot of content to share on your social networks. It’s an excellent way to have fresh quality content available for you to share. This is the fundamental strategy. You read other people’s posts and share those you find relevant and valuable for your niche. You can do this in your Tribal stream. Click on the title, click Visit site, read the post and then return to the Tribal stream and share it. After you shared an interesting post, the best thing you can do is to let a comment below that post (in the tribal stream). Tell the author how much you enjoyed the content, add your opinions about the subject, talk about an important point the author made in the respective post etc. You can see the comment field for each post under the post on the left. The right hand sidebar shows latest comments across all triberr posts. Tip: Do not forget to tell people you shared the post. If you don’t know what to say in your comment, just tell them you shared the post. Update by Ralf Skirr: Actually creating lots of 'shared' or 'stumbled' comments is frowned upon by some as a spammy way to get attention. 'Shared' or 'stumbled' is not a meaningful contribution to a post discussion. Each Triberr member can easily see who shared her posts in the detailled post statistics. You get an invitation from a tribe’s chief, to become a member of a particular tribe. What to do when you get an invitation to become a member? 1. What is the niche of that tribe? It is very easy to create a description and when it is missing, this is a lack of professionalism. If the tribe is not in your niche, run as fast as you can. If you are in the traffic building niche, for example, you don’t want you tribal stream inundated with posts about travel, fashion, health, weight loss, pets and so on. Just run. 2. Who is the chief of the tribe? This is an important question. Do not skip it. The chief determines the tribe so check him (her) carefully. Do you know him (her)? Check his (her) profile. What is the niche he (she) is active in? Check some of the chief’s blog posts to see what is he posting, where and how (the style). Who are the members of the tribe? Do you know them? Check them patiently. Study their profiles, the tribes they are in, what kind of materials are they posting etc. If you are techie blogger and do not study the members and join the tribe blindly, you risk to be flooded by posts about cats, dogs, iguanas, lizards, parrots, exotic places or chocolate and strawberries. Do you research well, otherwise you won’t get results from Triberr. 4. What kind of posts? This is a good place to find out the niche of that tribe. Check the latest 10-15 posts in that tribe. Is it one domain or more? Is it in your niche or not? Tip : Avoid multi-niches tribe. When I say multi-niches I do not refer to sub-niches. Example: In the internet marketing mega niche we have subniches like: blogging, affiliate marketing, traffic building, email marketing, video marketing etc. These are sub-niches and it is OK for a tribe to have sub-mniches of the same niche. However, there will be times when you will see tribes that include niches like: marketing, health and fitness, weight loss, fashion, travel, pets etc. When you see this, run for your life. Among all Triberr strategies this is the most important. Wait for a few weeks until you familiarize with the environment and with the Triberr’s rules, then make your own tribe. It is very important to have your own tribe (if you want success) so you must not forget about this. Don’t be afraid to become a chief. It is no big deal and it does not involve a lot of work to do in your tribe. You will attract new members, engage them a little and let them come and upload their precious content inside your tribe. Don’t be shy. Do it! Make a good description for your tribe. Do not forget this. Tell people what this tribe is about, what is the niche and what kind of members do you want. This is the reason why you should wait at least a few weeks until you make your own tribe. You must be a member of at least 3-4 tribes first and get some experience with the platform. Ideally, you should be a member of, at least, 9-10 tribes before making your own. During this process you will meet and study hundreds of tribemates. Identify the best ones and invite them to your blog. You should aim for quality and not for quantity. The number of members is limited (30 for free tribes, 50 for paid tribes) so choose carefully. Only the best of the best should be invited (or accepted). The rest of the world may stay in your tribe as followers. You don’t have to accept anybody in your tribe. I saw this mistake made over and over again in Triberr. If you don’t like the person, let him (her) remain a follower. If that person is not in your niche, don’t make him (her) a member. Never!!! I was tempted many times in Triber. One day I got a request form a person called S.T. (the name is fictional). He wanted to become a member of my tribe. I checked his profile and found out he was not in my niche but had more than 10000 twitter followers. WOW! What a powerful temptation. Finally, I decided to refuse the request. 10000 twitter followers are great but the possibility to be flooded by cats, dogs and monkeys or exotic places is horrible. I almost cried when I rejected him. This is what you should do. If the person is not in your niche, refuse the request. If he (she) has 1 million followers, you will certainly cry. Cry but refuse. What to do when the back door is opened? There will be times when you refuse to accept a person as a member of your tribe only to find out that his posts arrived on your tribal stream from another tribe. Triberr manages very complex networks of tribes in their matrix so this is always a possibility. In this case the best thing you can do to avoid those posts arrive in your tribal stream is to mute that person. Check the Help section to see how you can mute somebody on Triberr. That’s all folks. Study these Triberr strategies then go to Triberr and use it. It is free, it is simple, it is easy and it is powerful. The possibility to increase exposure and traffic for your blog is real and important. Also, the support is good and they respond fast. Don’t waste this opportunity. Sooner or later everybody will jump on the bandwagon and it will be more difficult to get good results. Take advantage now. Tomorrow it may be too late. 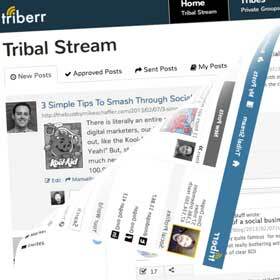 How to get started: Register with Triberr and add your social networks. This Triberr post was first published at netmarketsuccess.com. Now it’s your turn. What other Triberr strategies and tactics to increase exposure and traffic do you know? Please, share it with us.